Our body temperature is held at a fairly steady 37.5°C, and the assumption has always been that most of our physiological processes take place at this temperature. The heat needed to maintain this temperature in the face of a colder environment is generated by tiny subcellular structures called mitochondria. But a new study publishing January 25 in the open access journal PLOS Biology by INSERM and CNRS researchers at Hôpital Robert Debré in Paris led by Dr Pierre Rustin (and their international collaborators from Finland, South Korea, Lebanon and Germany) presents surprising evidence that mitochondria can run more than 10°C hotter than the body's bulk temperature, and indeed are optimized to do so. Because of the extraordinary nature of these claims, PLOS Biology has commissioned a cautionary accompanying article by Professor Nick Lane from University College, London, an expert on evolutionary bioenergetics. To ensure a stable internal temperature, the human body makes use of the heat produced by the last stage of food consumption: combustion of nutrients in structures known as mitochondria, of which there are tens or hundreds in each cell. Mitochondria form a complex network within the cell, and their contents are isolated from the rest of the cell by two membranes. A considerable number of biologically catalyzed chemical reactions take place in their interior; 40% of the energy that they release is captured in the form of a chemical compound, ATP, which is used to drive functions of the body such as heart beats, brain activity or muscle contraction. The remaining 60%, however, is dissipated as heat. The authors' results appear to show that, in maintaining our body at a constant temperature of 37.5°C, mitochondria operate much like thermostatic radiators in a poorly insulated room, running at a much higher temperature than their surroundings. This work was made possible by the use of a chemical probe whose fluorescence is particularly sensitive to temperature. When this "molecular thermometer" (Mito Thermo Yellow) was introduced into the heart of the mitochondria, they were able to demonstrate a stabilized temperature of about 50°C. Specifically, the probe's fluorescence suggested that the temperature of the mitochondria in living and intact cells, themselves placed in a culture medium maintained at 38°C, is more than 10°C higher, as long as the mitochondria are functional. This elevated temperature is abolished when the mitochondria are inactivated by various means. The researchers also showed that several human mitochondrial enzymes have evolved an optimum temperature close to 50°C, which helps to support their interpretation of the molecular thermometer data. Nick Lane, who was not involved in the study, but helped the journal to assess the manuscript, finds the results potentially exciting, but warns that further work needs to be done. In his accompanying Primer, he says "This is a radical claim, and if it is true, how come we didn't know something so important long ago?" Lane asks a battery of questions about the Mito Thermo Yellow probe, about the plausibility of the extreme temperature gradients which the authors' interpretation imply, and about the meaning of the very concept of "temperature" at such microscopic scales. "We need to know a lot more about both the specific behaviour of Mito Thermo Yellow and its exact location within the mitochondrion before we can come to any firm conclusions about 'temperature'. In the meantime, I doubt that the 10°C temperature difference should be taken literally. But it should be taken seriously." The authors acknowledge that these high temperatures at the core of the micro-space inside mitochondria are unexpected but emphasize that this revelation should lead to a reassessment of our vision of how mitochondria function and their role in cells. "Much of our knowledge about mitochondria, the activity of their enzymes, the permeability of their membranes, the consequences of genetic defects that impair their activity, the effect of toxins or drugs, have all been established at 37.5°C; the temperature of the human body, certainly, but apparently not that of the mitochondria," they say. "Heat has fallen out of fashion in biology. Whether or not all these ideas are correct, the distribution and heat generation of mitochondria within cells should be taken much more seriously. These researchers bring this important subject back to centre stage, which is exactly where it should be," concludes Lane. 37.5°C ?? It is my understanding that normal *average* temperature is 37°C with a normal range from 36.1 to 37.2. My body temperature is lower at an average of 36°C with a range of 35.5~36.5°C (glass-alcohol, digital and infra-red temperature sensors all give the same results). This research makes a lot of sense. WIth all of the heat loss that constantly occurs in a body, whatever is powering the heat must be at a higher temperature. It is logical. I'm skeptical - mitochondria are only on the order of 10 or 20 microns apart in most cells, a heat transfer even in water is very effective at that scale - the heat transfer coefficient is very high in a 50-micron-channel in a micro-channel cold plate, and would be ~5x higher at 10-micron spacing. So unless the mitochondria are tightly clustered, the whole cell would heat up. Hmm - Google finds "Division of Physarum mitochondria during starvation", which says ~5 cubic microns, which is about 2 microns in diameter, and 12M to 24M/mm3, which would be ~4 microns between them, or 2 um to conduct the heat to its area of a cell. The heat transfer of water is ~ 1 uW/(um*K) so the 5 degrees per micron would be 5 uW/um2 of heat transferred to stay 10C warmer than the cell around them. A 2 um diameter blob is 12 um2 surface area each, so that's 60 microwatts per mitochondrion or roughly 1000 million uw for the 12m to 24m mitochondria per mm3. So that's a kiloWatt per cubic millimeter, which is total bunk - on the order of 10x more than a whole human body in each cubic millimeter! That's off by roughly six orders of magnitude. Sure, the layering of water around a cell could cut thermal conductivity a few X, and humans might have 10x or even 30x lower mitochondrial density, and it is after midnight and I could easily have missed an order of magnitude somewhere, but even with all of those it would still be off by a factor of a thousand. So no, the mitochondria will not be 10 degrees warmer for any length of time even measured in microseconds. Bart_A is correct. And it not only makes sense, it seems like the only logical conclusion when you consider the rate at which we radiate heat. It has often been stated that a person generates as much as 80 to 100 watts (adding all the heat radiating off of every square centimeter of your skin). Consider as an analogy, a cabin heated by a stove. Even when it is only mildly comfortable all around the perimeter of the cabin, the stove itself might be much too hot to lay your hand on. The heat it puts out is constantly radiating away, just as the heat of the mitochondria radiates away through the tissue and then away from the body. As for the "why have we not heard of this before" question that Lane raised, it could simply be that technology is only now allowing us to probe cells at that kind of level. After all, they are measuring the heat output of individual parts of cells. Frankly, that is very impressive. It does seem pretty absurd to anyone that understands basic physics and biology like I that, even given the relatively low heat conductivity of water, such a minute object in a living cell that thus has a relatively huge surface area in proportion to its volume and heat capacity can readily maintain a temperature over 10C higher than its immediate surroundings without releasing heat at a biologically absurd high rate. I suspect what this article claims is nonsense and it would require merely one careful mathematical calculation of the physics of this (which you may have already done) to prove it is indeed nonsense. Not if what they claim is physically and biologically impossible, which, from my personal scientific knowledge, I strongly suspect it is. I'm surprised with the level of disbelieve, Unbelievable! I myself find it plausible that a Mitochondria could be hotter than the cell surrounding it. For example: take my smartphone as example; I'm holding it on my hand and it isn't hot, but the CPU is at 50 degree Celsius, it is hot to touch. This is how the physic make sense; it's plausible to have such temperature gradient in any system. In case of biology, it's not odd at all to have a bacteria living at 50 degree Celsius; a thermophilic bacteria can survive over 100 degree Celsius. It is probably functioning without relying on any Enzyme that it sensitive to temperature; our cell membrane can survive its structure at 50 degree Celsius with a right mix of cholesterol molecules. It has often been stated that a person generates as much as 80 to 100 watts (adding all the heat radiating off of every square centimeter of your skin). 100W is the figure that I used for the heat produced by a human, so that part of your comment is correct. But based on the size and density of mitochonrdia, the temperature difference that the articles claims would require a 1000W from every cubic millimeter of tissue. You are correct that whatever is producing the heat will be at a higher temperature. But the article gives a specific amount higher, and I am pointing out that that specific amount is WAY OFF. The mitochondria will NOT be 10 degrees hotter, because at the scale of mitochondria that that would require something on the order of a million times as much heat as a human produces. So they will definitely be hotter, but by a small fraction of a degrees and NOT by 10 degrees. @RealScience, but they found out that Mitochondria Enzyme also work well at 50 degree Celsius, so it further support their temperature probe & its measurement. What motivate people soo hard to disagree with these finding? I mean... we are lazy, why we overthink this at all? Providing that the mitochondria volume represents only a tiny fraction of the total human cells/body volume, your calculation actually gives a meaning to the above study. The rough calculation showed 1000 Watts per cubic millimeter of CELL, not per cubic millimeter of mitochondrion! Maybe the absorption of dye to cell membranes changes the temperature of fluorescence transition and gives biased results. Mito thermo yellow in cells can have quite different structure from that in aqueous buffers. That's exactly the type of thing that I suspect is the cause of the 50C reading. In this case their enzymes could represent a rudiment of thermophillic nature of these proteobacteria, not a product of adaptation to actual temperature inside mitochondria. I've worked with heat conduction over small distances of water for quite a few years and the claim of 10C warmer over short distances looked way off. Over the years I've learned that it is best to do the math and check the intuition. It was after midnight, and I had a few minutes to wind down so I did the rough calculation to check, and type in my thought process so that anyone who wanted to could check. If the calculation came out off by a factor of two, I'd believe their probe. But the heat flow would be off by a factor of a million, so it is clear that they have the wrong explanation for what they observe. As for the correct explanation, mackita has some that look solid. maybe we face some anomalous physics here ... Maybe the rotating ATP synthases generate a similar field around itself, thus behaving like miniscule radiators of scalar waves, which heat only ions and dye chromophores bound on membranes - but not neutral atom nuclei, thus giving false temperature signal. It doesn't need to be that complex. 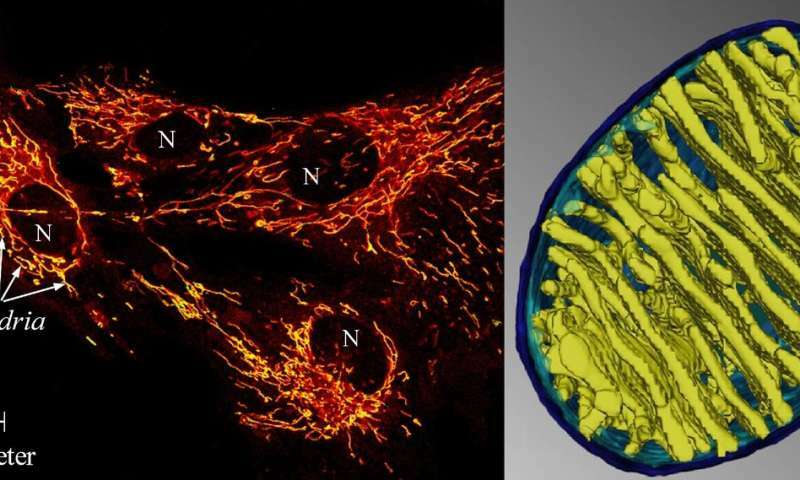 The chemistry inside the operating mitochondrion could just stretch or twist the dye molecule a little bit to change the temperature at which it fluoresces. Your comment that "Mito thermo yellow in cells can have quite different structure from that in aqueous buffers" sounds like the right track. Mitochondria are the oldest structures in cells, archaeologically speaking, so this is interesting. Perhaps in the remote past, Earth's temperature was much warmer. Which is why I referred to "the chemistry inside the operating mitochondrion" rather than in an inactive mitochondrion. An operating mitochondrion creates some pretty strong gradients that normalize rapidly once its respiration stops. I think that it is far more likely that one of those gradients (or other chemistry) would alter a temperature-sensitive molecule (much the way lime juice in ceviche can chemically induce similar protein changes to thermally cooking a fish), than that something alters the physics of heat conduction in water to reduce it a million-fold in a cell. Cells tend to order water molecules, and ordered molecules generally have higher thermal conductivity - for example ice has ~3x the thermal conductivity of water. So if anything thermal conductivity in a cell would likely be higher than plain water, not lower. "Many other variables could potentially affect its fluorescence, notably pH, oxygen tension, superoxide production, and membrane potential, but Chrétien and colleagues controlled for these variables as well as can readily be done given that MTY quickly leaks out of uncoupled mitochondria, abolishing a meaningful signal . That precluded a closer analysis of other possible confounding factors, such as changes in Ca2+ concentration. Like other rosamine-based dyes, MTY fluorescence can be quenched by aggregation at high concentrations, but the low nM concentrations used in the study should have precluded quenching. The major cause for concern from earlier work is that the change in fluorescence can be sensitive to the tissue type; the fall in fluorescence in brown adipocytes was 2.0% per 1 °C rise in temperature  for reasons that presumably reflect the dye's response to a specific environment."